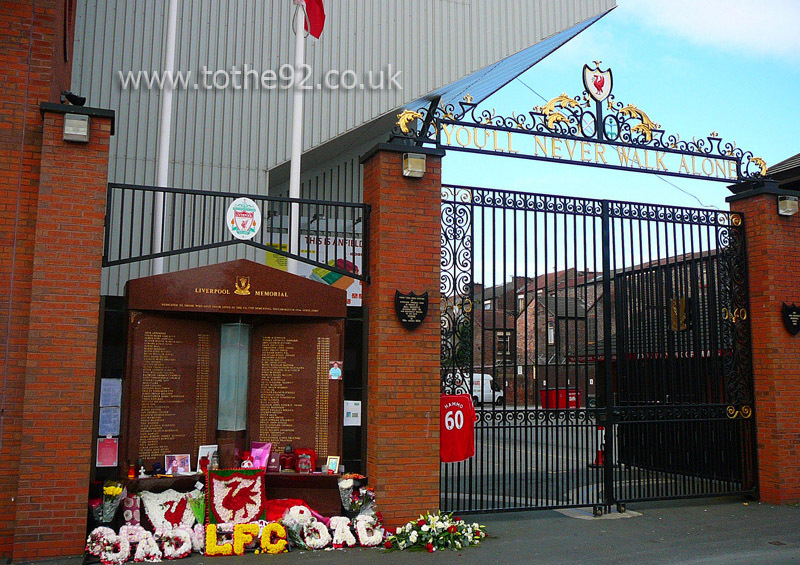 Anfield is a traditional football ground situated in amongst rows of houses. The statue of Bill Shankly together with the Paisley gateway, You'll never walk alone gates and the Hillsborough memorial make the outside just as special as the inside. The Kop and the Main Stand are both single tiered whilst the Centenary Stand and Anfield Road end have two tiers. The main stand does however have a number of pillars. The Kop on a European night is very special. Although, everyone stands for the whole game so be ready to only sit down at half time! 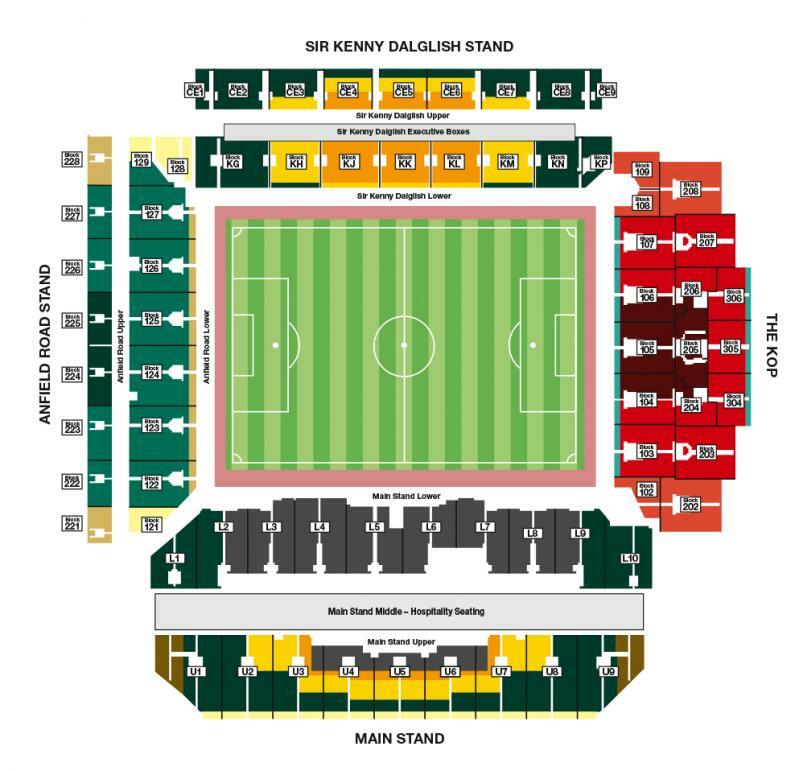 Visiting supporters are located in the lower tier of the Anfield road stand (on the main stand side) where there are seats for up to 3000 fans. Views are generally good but try to avoid the seats in the back three or four rows of the lower tier as it can become very difficult to see if people in front aren't sitting down. Catering and toilet facilities are similar to other parts of the ground - pretty basic but very usable. Queues can be long and they tend to run out of food at half time. The ground is located outside the city centre, but there are numerous pubs and fast-food outlets on Walton Breck Road and Oakfield Road, within a stones throw distance of the ground. The main away pub is The Arkles, located on Anfield Road (adjacent to the away end), but the vast majority of pubs around the ground are welcoming of away fans, as long as they're well-behaved! If you're a fan of oriental food then you may wish to check out Chinatown. The city is home to one of the first established Chinese communities in England, due to its history as a port city, and boasts the largest ornamental arch outside of China itself. Chinatown offers a wide choice of restaurants, serving decent food at reasonable prices, open late into the night. Parking isn't generally a problem. You have the choice of parking in secure car parks in the Goodison area at a cost of £6 or if you're early enough, you'll find spaces along the streets, also in the Goodison area. It's a short walk through the park to Anfield and is well signposted. Bus and train links are very good and the lack of on site stadium parking is the only think that lets the stadium down for me. That said, I enjoy the walk in with all the other fans. The nearest / closest train station to Liverpool's Anfield Stadium is Lime Street. Liverpool’'s mainline railway station is situated in the city centre and is about two miles from Anfield. A taxi from Lime St. will cost about £6.00 for up to 5 passengers and take approximately 10-15 minutes. Several buses go to Anfield from Queen Square opposite the station and on match days there is also a direct SoccerBus service from St Georges Hall (also opposite the station). Anfield isn't particularly accessible via local Merseyrail trains (its easier to get a bus / taxi from the city centre) but you can take a Northern Line train from Lime St to Sandhills Station and catch a SoccerBus from there to the ground on match days. Travel: I travelled by car. There is plenty of car parking but mostly on the streets. Unfortunately, in my experience, you have to be very careful and pay the little kids to watch your car or might just regret it. Refreshments: There are pubs right next to the ground and plenty of burger bars which are quite reasonable. Impressions: This ground drips with history and is very daunting, it sends chills down the spine. It always has an electric atmosphere. Facilities: Excellent. As you would expect from a top team that look after the fans. Exit: It takes a long time to get away as it's all side streets. Enjoy: I always enjoy my days out here. Every football fan has to make time to visit Anfield. It's a must! Have you been to see a game at Liverpool's Anfield? To tell us about your experiences and to feature on the site, simply complete the fans review form below!